Dear Freshens, will I ever find a smoothie as delicious as you? 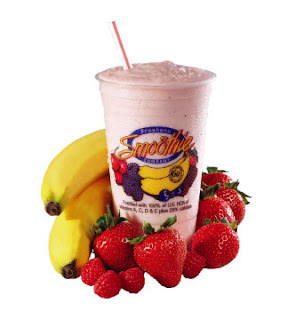 I'm always on a perpetual mission to find the most delicioius smoothie out there. So far it has been the smoothies made by Freshen's, which happened to be at my college gym (and therefore the only reason I would go), BWI, and Columbia Mall. But what about in the great city of Baltimore? There has to be a haven for all smoothie lovers, like myself? Then, while on a walk during lunch I discovered a new cafe called "Java Joe's" and on top of their coffee and sandwich selections, they also boasted about their All-Natural Smoothies. This is where my eyes transferred these delights to my stomach and brain. All-natural, all-fruit-- those are the words that I want to hear. I hate syrup-made smoothies. I love the smoothies that are freshly prepared with some fruit and a blender. That is when I knew what my taste buds were yet to find out, it was going to be gross. And oh it was. It was so sweet that my sweet-tasting receptors on my tongue almost burst. And here is the worst. I could not finish it. Now you know it was bad. I HATE throwing food away, even though my hubby likes to point out that it's a sunk cost (you still bought it regardless of the fact that you ate it or not). So anyway, basically, don't go to Java Joe's for their smoothies. They are lying about it being all-natural. However, I am not going to tarnish their reputation and say to not go there at all, because their sandwiches look pretty delicious.